“Plants that delight the sight and smell’. Albertus Magnus describing Medieval plants…now know as cottage garden plants. 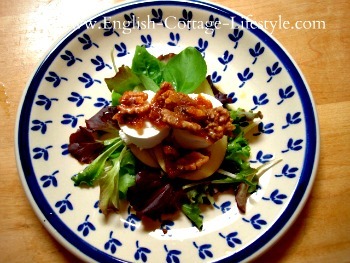 Recipe Of The Month: "Pear and goats cheese salad with walnut brittle." Cottage Chat: Notes From The Cottager. Summer will be here soon and you may feel like visiting England’s beautiful gardens while on holiday or at home so I thought that you may like to know a little about the origins of the English cottage garden, the roots of which can be found in Medieval gardens. 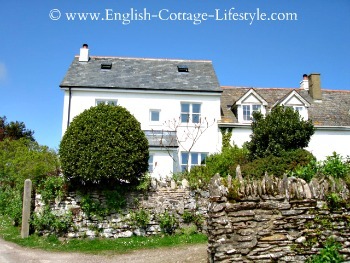 The word ‘cottage’ is Medieval. The recipe of the month was inspired by the many types of food found in Medieval gardens and tastes delightful…Pear and Goats Cheese Salad with Caramelized Walnut Brittle. Medieval Gardens may be of interest to the cottage gardener as the origins of the English cottage garden begin with the Medieval garden. There are no Medieval gardens surviving, but thanks to works of art and archology a record has been kept of small and large gardens including plants and garden features. In all types of Medieval gardens privacy was the running theme, it appears to have been important to them in their garden designs. Garden features such as ponds, fountains, moats, streams (an Anglo Saxon word), arbours and garden seats have their origins in the Medieval garden. The traditional garden was for relaxing and meditation or socialising over a meal. They very rarely ventured outside and the garden was enclosed for security as well as privacy. Deer Park or Hunting Park. A natural habitat was created for the deer so that they could breed and have shelter. The park would be around 200 acres; the largest type of garden. It would provide both hunting and timber. There could also be a hospitality or hunting lodge where guests could admire the deer from a comfortable distance grazing on a launde. It was often secured with a high wall. An area of grass was called ‘launde’ from the Normans meaning ‘land’ in old French. England was once a primeval forest and when a clearing was seen by the Normans they called it a launde. In Medieval English it means ‘an open space among woods’ it would be several more centuries before the word ‘lawn’ would be used; when the parkland reached the house. Pleasure Park or Landscape Park; Pleasance. The Pleasure park was enjoyed by the top of society only a King or an abbot or bishop would have one. It is a miniature version of the hunting park described above, the difference was that the animals were not hunted, they were to be watched and enjoyed. The King and Queen may also have a summer palace in the park. As the name suggests it was a garden created for pleasure of the senses, for walking around in and being close to nature. Ponds and rivers were created for fish and wildfowl and game birds were introduced as well as rabbits and hares. The park became a haven for singing birds and native species. Some parks became a place to display exotic animals such as lions and camels. A garden for your soul. These gardens were a place to relax and enjoy life as well as a place to bury the dead. They were a combination of many types of mediaeval gardens all needed to produce food for the poor, the sick, the Monastery and for travellers and guests passing through. They sometimes sold produce for added revenue, these gardens had to perform. It is from the many manuscripts that the abbot copied and stored that he gained his medical knowledge and medicinal plant knowledge. Monastery gardens were self sufficient and it is from their experiences and results that most of our understanding of horticulture comes from. They produced their own food, wine and herbs both for medicine and cooking and had orchards and bees producing both honey and wax for the candles. Vineyards were Roman design from about AD 280 when they occupied Britain. After their fall the Christian missionary’s claimed them in the 6th century. At the time of the Domesday survey thirty eight vineyards were recorded. The 11th and 12th century were among the warmest in English recorded history and, after the Norman invasion of 1066, for the next two centuries many southern climate plants could be grown as far north as Scotland. A garden of about four acres designed for strolling under the blossoms and sitting under shady, private arbours. It was about relaxation more than producing food, it would be fenced in with possibly hedging or walls to keep the animals out and to provide added security and peace to those inside. The orchard would be planted with one type of fruit or nut tree or with a variety of trees. The main fruits and nuts grown were; apples, pears, cherries, plums, mulberries, medlar, quinces, figs, chestnut, almonds and walnuts. The word ‘cherry’ is Mediaeval. They also produced cider, Perry and Verjuice. Verjuice was an acidic and salty juice prepared from unripe apples (or grapes) and was used in cooking, and gives the sharp flavour of lemons and tomatoes, that we use today. A garden that contained food and medicinal plants. They also grew plants for stewing on the floor to ward of nasty smells and vermin, plants to repel insects and plants that had some use in the home. The earliest example dates back from 1374 called a ‘kechengardyn’ which shows an area devoted to vegetables. Mediaeval gardens also had raised beds, paths to walk around and irrigation systems. Many of the plants grown were listed by Thomas Tusser in the 16th century some were medicinal others were for pottage. The plants grown were; colewort (a Mediaeval plant similar to plain kale), leeks, parsnips, turnips, beans, peas, garlic, chives, sage and parsley. They sowed at the begging of march and either harvested in six months or twelve months depending on the crop, they practised crop rotation and gardening in harmony with nature. There could also be a physic garden in a larger home. The physic garden was for medicinal herbs and plants and for perennials. It would be enclosed and sometimes shut off as it may have poisonous plants inside. Bees could also have been kept in straw skeps (from the Anglo Saxon for basket). 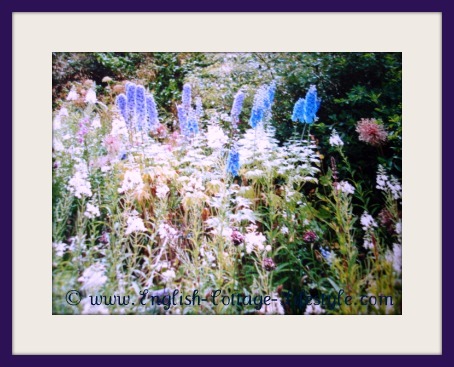 A smaller garden under an acre in size it would have a lawn the borders would be full of herbaceous aromatic herbs. It would be enclosed, privacy being of importance in Mediaeval gardens and could also contain flowers. It is the type of garden found in works of art. They are often very small compared with the gardens we know today. The Mediaeval flower garden was often called hortus conclusus - a garden that is enclosed. This is where most of the population would have lived. It was similar to a smallholding where the peasant would have raised livestock and vegetables. Records exist from taxes, deaths and tithe lists of what the average peasant may have had on his land; a plough horse or ox, a cow and calves, a pig and piglets, possibly sheep and lambs, also chickens, geese, ducks, hens, doves and bees. They would have had a vegetable garden, herbs, fruit trees and any plants that had a use and sometimes pasture for grazing. The most popular type of hedge was Hawthorn, traditionally known as ’quickset’ hawthorn because it grew quickly, it was used in Medieval estates and in the gardens where it may have grown intertwined with honeysuckle and roses. The plants that were traditionally grown in the 13th century were ‘Cottage Garden Plants’ and favourites include; roses (red and white), violets, irises, Madonna lily and peonies. Blossoms would have also provided sent and flowers. These plants were described by Albertus Magnus as ‘plants that delight the sight and smell’. Growing flowers is time consuming so the preference back then was on producing food and herbs for medicine. The prosperity of the sixteenth century brought on the ability to grow flowers for pleasure. “The Medieval Garden” by Sylvia Landsberg. “How To Read An English Garden” by Andrew Eburne and Richard Taylor. ‘Hangleton’ a recreated retired peasants 13th century home and garden. ‘Bay leaf’ a wealthy yeoman’s 15th century home and garden. May is a great month to get the cottage and garden in order. May marks the beginning of the holiday season. So try to do those odd jobs now so that you can relax a little during the up coming sunny days. The City of Wells in the county of Somerset is the smallest city in England with only approximately 12,000 inhabitants. It is because of the famous cathedral that Wells can call itself a city. It is a wonderfully preserved Medieval city and worth a visit. There are many historical attractions to this city; the 13th century Cathedral, the Bishop’s Palace and Vicar’s Close just to get you started. Tasty local food is easy to find in the local restaurant’s, pub’s and Inn. 1)Toast walnuts in a non stick pan. When toasted, set aside on a plate. Add sugar and melt using the lemon half on a fork as a spoon, add butter, toasted walnuts and cook a few minutes, stir so it does not burn, cook until golden. Set on baking paper to cool; making sure that each walnut is drizzled in the brittle. 2)In a small bowl prepare the salad dressing add the rapeseed oil and gently add the garlic, lemon, salt and pepper. If you want a nutty oily dressing add more oil or for a taste of summer add more lemon. 3)Wash and prepare your salad leaves arrange on the plate. Drizzle the salad dressing over the leaves. 4)Slice ripe pears thinly and add them on top of the dressed leaves. 5)Cut goats cheese into 4 pieces and place on top of the pear slices, add basil to garnish. 6)Break up the caramelized walnut brittle and place on top of the sliced goats cheese. This is enough for 2 people with some walnut brittle left over…if it lasts that long!